The Luczyk family is originally from Poland, or at least that is my assumption based on the name (and the claims of my son-in-law.) I have not traced this line back to Poland yet. The earliest Luczyk I have found is Stanislaus Luczyk, who was born in Manistee, Michigan in 1880. His wife, Mary Karolczak, was born in Poland. 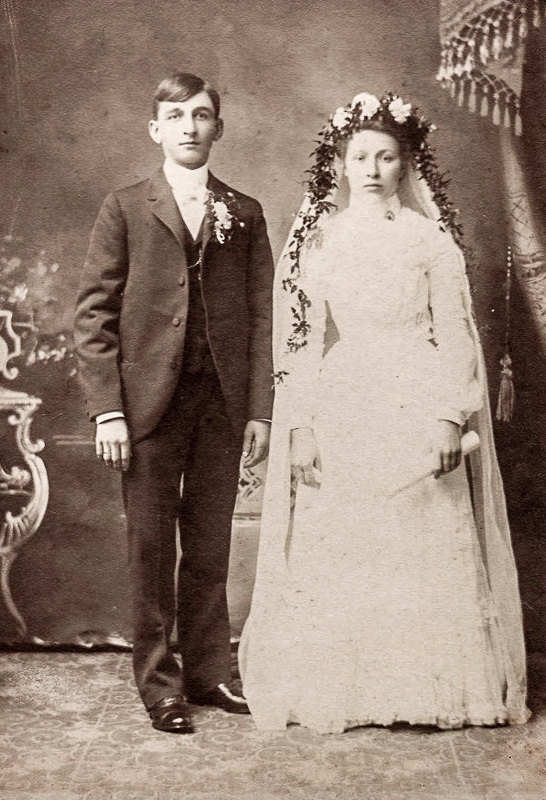 Stanislaus and Mary were married in Manistee on 25 Nov 1901. That’s them in the picture at the top of this post. Stanislaus’ son Peter married Lucille Maskey (or possibly Maske). The Maskey family is also from Poland, but Lucille’s mother was Leonard from Austria, not Australia, as is actually written in the 1920 census. Peter’s son Michael married Nora Baar. The Baar family may have originated in Czechoslovakia. John Baar and his wife Rozalia Schmidt were born there according to the 1930 census. However, the 1910 census says they were both born in Germany. Nora’s mother was Lillian Geerling, and the Geerling family from the Netherlands. Jantje (Dekker) Geerling came to the US with her family in 1887 following the death of her husband, Jan, and settled in Muskegon, Michigan. They were from the town of Usquert. There are a slew of families connected to the Geerlings in the Netherlands, including the Bonnes and Boer families. Researching these is where various websites for translating Dutch to English because very useful! Lillian’s mother was Hanora Griffin, whose mother and father were born in Ireland, and who settled in the Detroit area. This post just skims the surface; I have added many other people related to these families to this site. I hope the information I have collected is useful to others researching the family.